Fireworks are illegal in Ireland, apparently. But that sure as heck doesn't stop them using them. They seem to be on sale all over the place and if you go into residential areas, you can hear them already. So I guess Hallow'een is a really big deal here. I'll be saving my pennies till the end of the month so that I can go out and have some fun without having to worry about money too much. Following my brief but succesful venture forth on a bicycle last week, I've done it again. 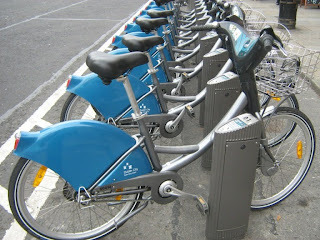 As you can see, the bikes are quite chunky, but they are none the worse for that. I see some chicks going around town with bikes they've personalised with artificial flowers and stuff. I wonder if people are going to do that sort of thing with these? Wouldn't that be fun? Anyway, because of the financial situation, this weekend I'm having some friends over tomorrow night. We're going to watch a DVD and eat. Thankfully, Bepe is cooking. He is bringing along some buddies who, I think, are coming less for the free food and more in the hope of meeting some Irish women (the friends are Irish gals from my department). Lamentably, Bepe's girlfriend will be there too. You can't have everything. I have already done some of the grocery shopping for the weekend on what is one of my favourite streets in the city, Moore Street. While you would hardly call it elegant, I love it, from the old ladies touting illegal fireworks from battered prams, to the fruit and vegetable stands, to the Chinese Lotto outfits to the mall where you can get all sorts of exotic ingredients. It feels so big-city-real but also very Irish. And you can have the best conversations with the people who work there. "Dese Africans," one woman said (I am trying to write in Dublinese). "They are great cooks. "There was a fella here with a bunch of quare stuff and I asked him how you'd cook a yoke like that and didn't he come back the next day and he'd only brought me a Tupperware dish with the meat and the sauce in it and I brought it home and fecked it in the Microwave and it was only delicious." If I'm feeling motivated enough and don't have a hangover, on Sunday I'm going to go here: The Huge Lane. Classical music is not necessarily my usual thing, but I've been told its free and, as I said, money is a bit of an issue for me right now! I had sort of got my hopes up after the whole is-it-or-isn't-it a date thing at the restaurant with Beautiful PhD guy. I mean, we were getting along great, he's really funny and great and gorgeous and totally like, Oh, Johnny Depp 15 years ago. And then today I ran into him and he was with a kid. I'm not so good at guessing kids' ages but I'm thinking maybe three or four. Still in a stroller, anyway. I was like: "Oooh... babysitting for the day?" And he said: "No, she's mine." "Yeah, me and her mum split up a year ago and we have joint custody." "Well it is and it isn't. Love her to pieces." And then he said: "But obviously I'm not planning to get into any relationships until she's old enough to understand." Total downer. Was it directed at me? Was it a pointed remark? He followed it up by saying that he'd had fun the other night at the restaurant and we should meet up again. So I guess we are buddies now. So I'm going home to spend a quiet evening in with Bepe, who is having similar financial woes as tipping is wayyyyy down. Fortunately, Hallow'een is coming up so hopefully there'll be some free entertainments. After all, Ireland is where it was invented, right? So those crazy Celts're bound to come up with something. The Dublin Tourism people sent me a couple of tickets to a ghost bus tour so I will have to look into it and see if it's interesting. Plus. Does anyone know how to make Barn Brack (sp?) Apparently, it's a tradition Hallow'een cake, and I think it would be kind of cool to make my own. So...woke on Sunday to find the skies gray and rain pouring down outside the apartment. I had planned to organise something healthy and life-affirming, but instead I just rolled over in bed for some more shut-eye. It looked as though the weather had settled in for the day. When I woke again, about two hours later, the skies were blue and the sun was shining down innocently, as if it had been there the whole time. I love the way the Irish weather keeps you guessing! At that point I was running late so I rang Saoirse and arranged to meet her for a walk up Killiney Hill. She was all "Groan...I've got a hangover..." but I reminded her of the couple of extra pounds she keeps saying she wants to shift so we arranged to meet at the park out there and then Just Do It. Well, I have to say the view was amazing. I don't think I saw all the way to Wales, but with a slight squint and by looking directly into the sun, I could convince myself that maybe... Glorious. S had had the foresight to bring some sandwiches so we just sat at the top of the hill and luxuriated in the amazing view. I like living in the city centre, but I can see the attraction of Killiney! Fortunately, it's not far on the DART. Later on, when I was getting off at my station and ready to head back to the apartment, something marvellous happened. I was walking up along the back of Trinity when I bumped into the gorgeous PhD student guy. "Hope you're not working on a Sunday," I said. (Is the library even open on Sundays--have to confess, I don't know). "Heh, no," he goes. "I was just going for dinner. Eh. Want to come?" Well, I made a show of checking my mobile phone and pretending that the friend who I was otherwise supposed to be hanging out with had just texted me to say that she couldn't make it after all, and then we went to this cool Thai place that I totally couldn't afford (thanks goodness for Lidl coz that's where I'll be eating for the next 2 weeks. The meal went well though, I think. It didn't feel like a "date" as neither of us was dressed up or anything (in my case quite the reverse as I was all sports-casual ((read "a mess")) following the walk. Also, I dropped some hot noodles into my cleavage and had to deal with that in a less than dignified way. But we parted with a friendly kiss on the cheek and vague promises to "do it again sometime." Plus, we exchanged numbers. Back at the ranch, Bepe came back from having been to the match at Croke Park. What match is that? The Ireland vs Italy World Cup Qualifier, you dope! Although it was a draw and Italy qualified he was kinda moody as he felt they should've won. I guess maybe he's feeling homesick...? Anyway,between my expensive dinner and his expensive ticket, we'll both be spending a lot of time around the apartment for the next little while, that's for sure.